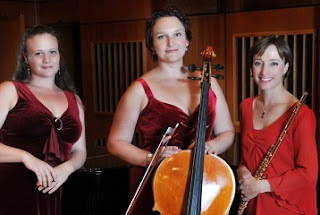 The next Friends of Music recital will feature Trio Esperanza on July 18. The ensemble includes Liesl Stoltz (flute - SA); Polina Burdukova (cello - Russia) and Kerryn Wisniewski (piano - SA). The Trio Esperanza is a combination of award winning and critically acclaimed musicians that have been successfully performing together and separately, around the country and abroad. Some of the events where the Trio has been invited to perform include the UNISA Concert Series in Pretoria, Promusica theatre in Roodepoort, UJ Concert Series in Johannesburg, Aardklop National Arts Festival, Nederburg Concert Series and the Darling Music Experience. Their programme will include Hummel’s Trio in A major, Op. 78; Tann’s Gardens of Anna Maria Luise de’ Medici; Gaubert’s Three Watercolours and Kapustin’s Trio Op. 86. The Prelude Performer will be Tasmin Hastings - violin, a 14 years old student at Durban Girls High. She will be accompanied by Bobby Mills.